The UK's finest examples of Westfalia Campervans. Employ our experience to inspect/import your chosen vehicle. Complete the form below wth an idea of what type of Westfalia(or German motorhome) you are looking for. This service is for post 2000 model year. We provide a comprehensive list of all costings/expenses for your chosen vehicle and typicaly saves £3000 to £4000 versus UK dealer retail. Some of the documentation now required includes in addition to German papers, NOVA, COC, VCA, MOT, DVLA with modifications required on route. Germany is no different to England, the same pitfalls exist with dealers/places to avoid. Client commissioned my service to import and UK register this vehicle and also to sell their 2007 Marco Polo. As well as a smooth transition between vehicles, client probably saved £5k all in across both vehicles. 2010 model with 25000 miles, customer saved £3000. 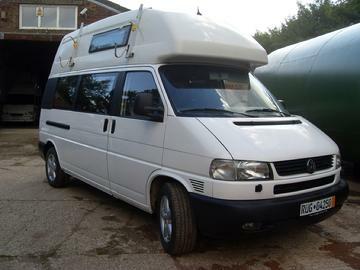 2008 model, 45000 miles, 4 berth, very rare vehicle and similar and cheaper then the Mercedes James Cook equivalent. 2008 model,20,000 miles, with every option. Cost 67000 euros on direct source. Customer utilised part of our direct source service including negotiation, German administration check list, UK compliance check list, ex business model so also VAT guidance, UK registration including private plate on retention. Extensive library available please email. 2000 model cdi, 88,000kms, brief, budget up to �30k, this model was �22k all in OTR, extra bike rack fitted and surf roof rack fixture. Spotless condition with solar roof panel, big awning casette, water boiler, shower, casette toilet, wet room, eberspacher heater, large compressor fridge freezer, the perfect van coversion. 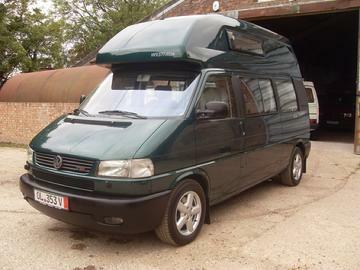 150ps 2003, 74000kms, 2.5tdi, cruise control, TV, sat nav, heated seats, aircon, 4 berth, EDS,PAS, eberspacher heater, digi control panel, 80amp leisure battery, luggage net, 16inch VW alloys, privacy glass, bike track, surf rack, we will now MOT,UK register, fit alarm/immobilser, additional under seal, MPH conversion, RHD lights, fit fiamma 3m f45i awning. Customer saved �2000 versus equivalent UK dealer prices but more importantly secured the campervan that best suits their lifestyle.